As many of you may know, I am a big advocate of natural coloring sources from food, as I am a mother. I stopped mentioning as it’s repetitive but usually I will use natural coloring as much as I can in my bakes eg charcoal powder, cocoa powder, blue pea flowers, red yeast powder etc. I am really excited to have found an excellent natural food source for purple color in my bakes! 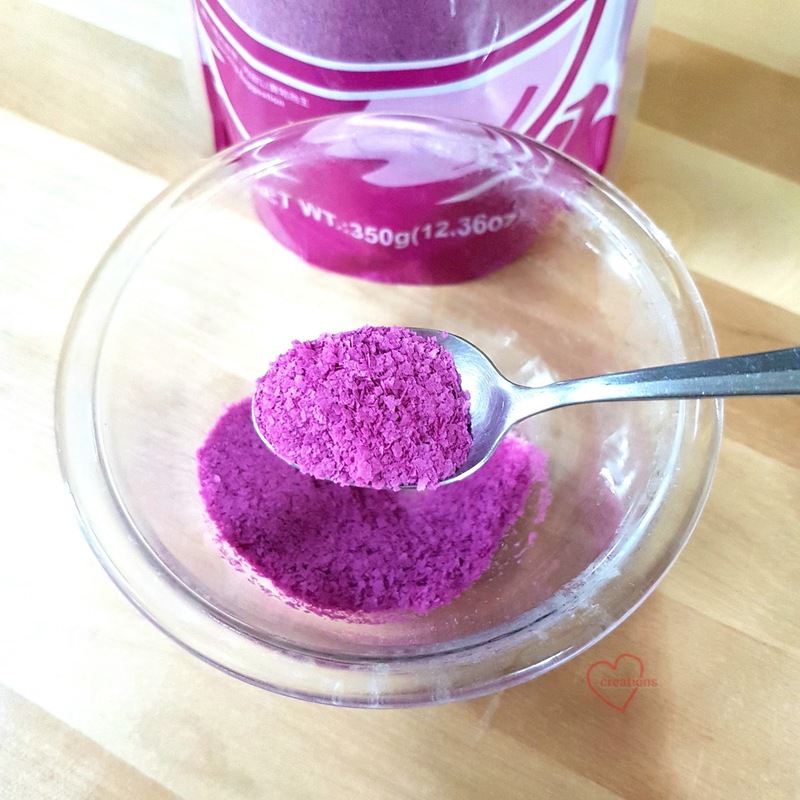 This purple sweet potato powder from Natureally is not only a stable natural purple coloring (that doesn’t change colour after baking), but packed with nutrients and flavour from purple sweet potato! I was excited to read from the packaging that this contains 100% purple sweet potato, no other artificial additives. In my early days, I had made paste from purple sweet potato from scratch for my kids’ food and bakes, but it was too time-consuming on a regular basis, so this is a godsend! Also I find it more effective than the blueberry powder I used previously for my purple colour. It is easy to totally dissolve the powder to reconstitute the purple sweet potato without purple spots in the cake. The colour is really pretty, isn't it? 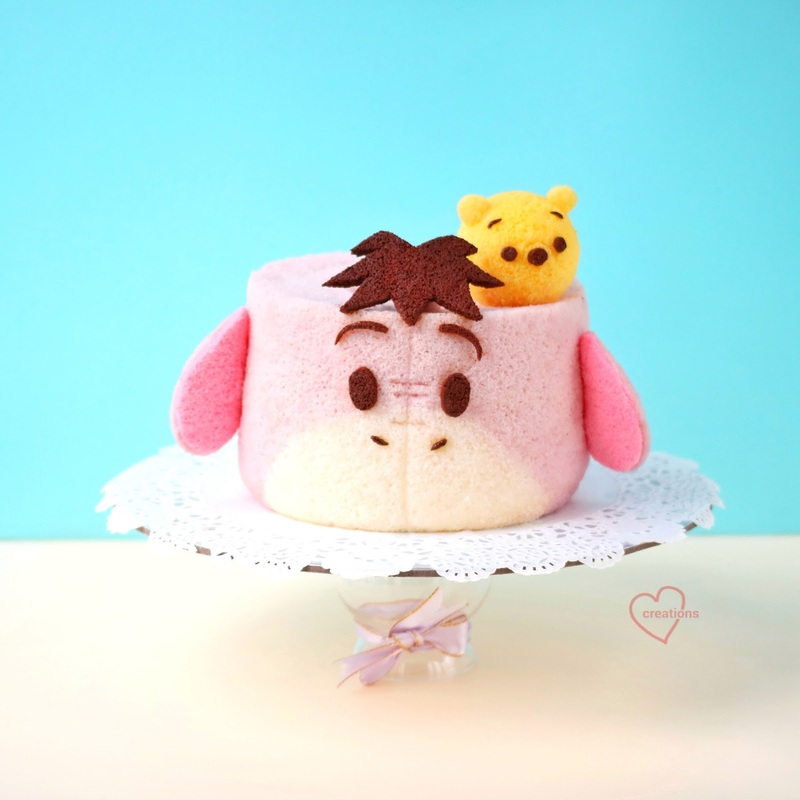 This sweet ‘Eeyore’ Chiffon Cake came out looking really sweet with its natural purple color totally from the sweet potato powder, and nicely fragrant as well. For the final cake, I made a pooh friend from orange chiffon cake baked in an egg shell to accompany the Eeyore =). 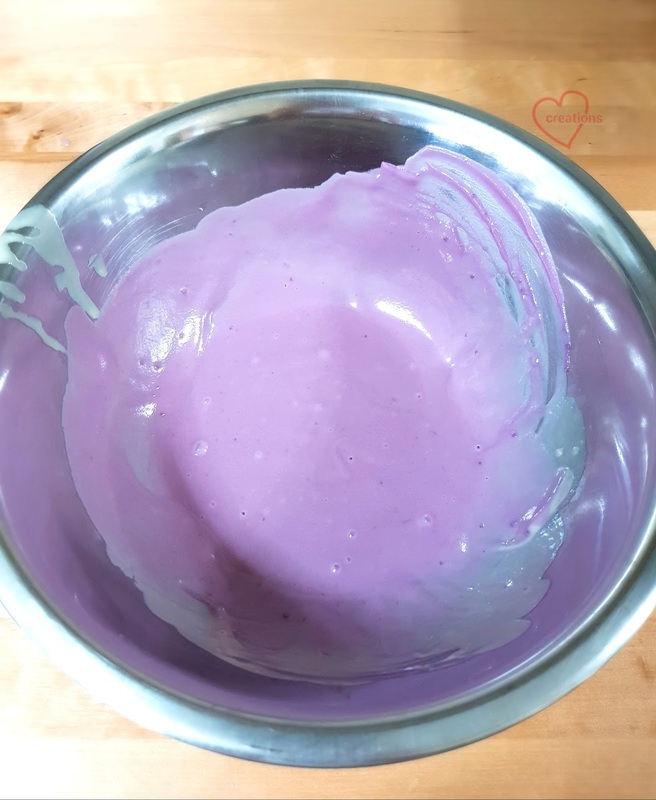 Recipe for the Purple Sweet Potato Chiffon Cake is shared below, using the natural purple sweet potato powder. 1. 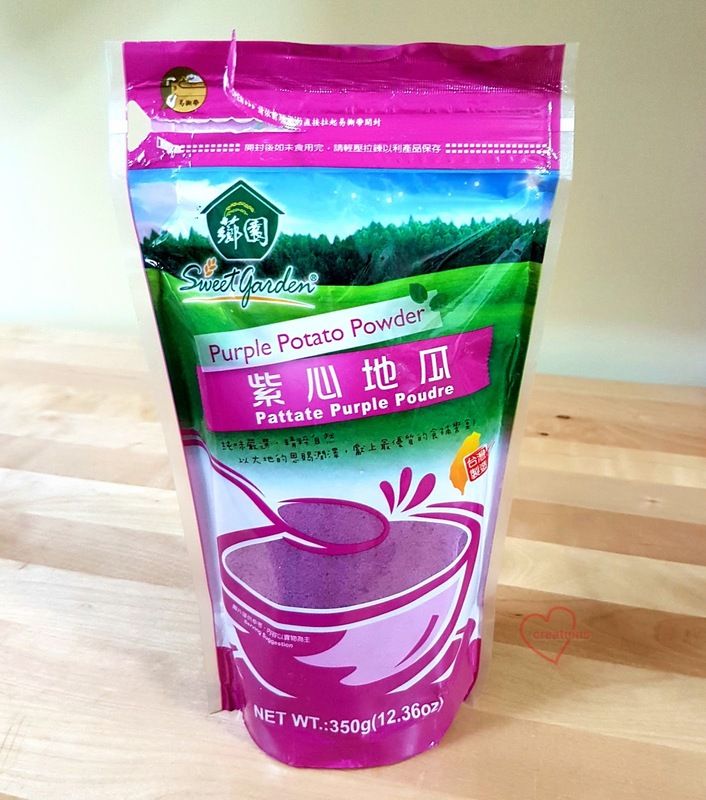 Prepare the purple sweet potato smooth paste. 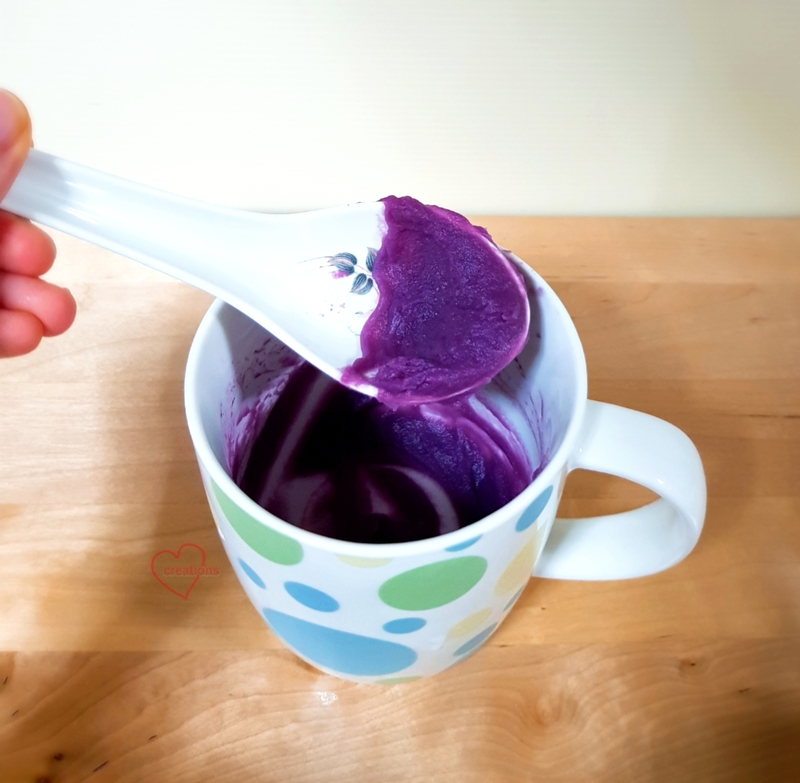 Dissolve 15 g purple sweet potato powder in 60g hot water. Stir well, so that no more specks of powder is seen. 2. Preheat oven at 160°C. 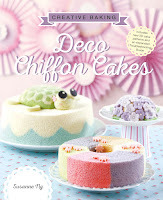 *I used steam baking like ogura cakes but it is optional. 3. 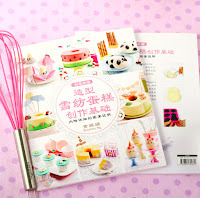 Beat egg yolks with sugar with whisk till pale and light before stirring in oil, water and vanilla extract. 4. Add in sieved flour and whisk till no trace of flour found. 5. Whisk in purple sweet potato paste into the egg yolk batter till even colour. 6. Meringue: Beat the egg whites with ¼ tsp cream of tartar till firm peaks, mixing in caster sugar in 2-3 additions. 7. Fold in the meringue gently into the batter 1/3 at a time using a flexible spatula. 8. 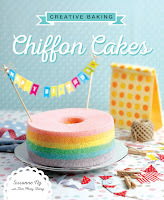 Pour into chiffon pan and gently tap on table gently to remove air bubbles (remember to hold down the tube when you tap). 8. 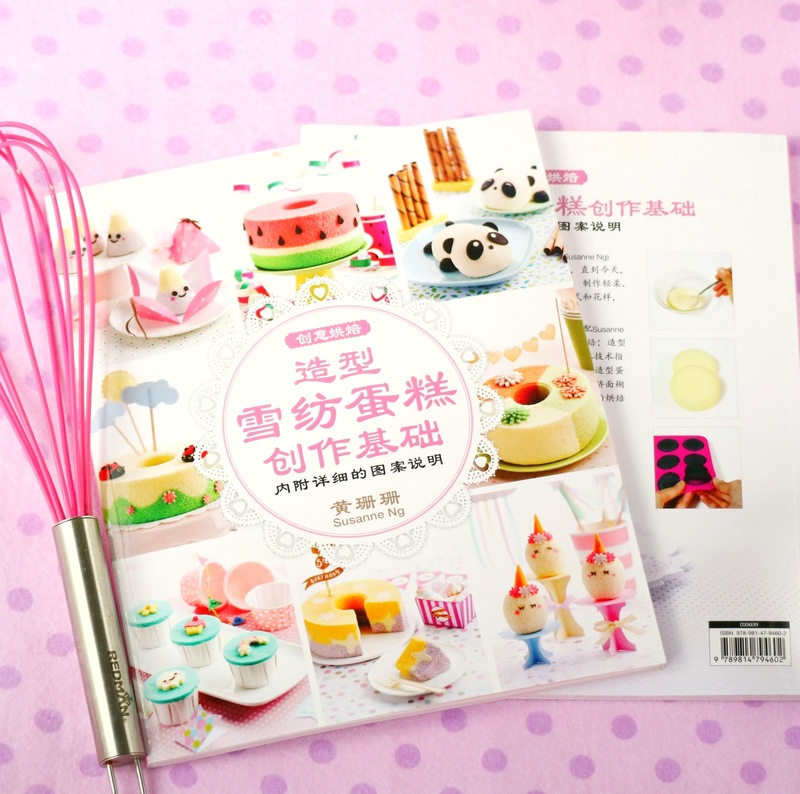 Bake for 160°C 15 min, then 140°C for 25+ min, or until skewer inserted into centre of cake comes out clean. *Alternative baking condition if your oven does not respond well to temperature change: 140°C for 55+ min (or until skewer comes out clean). 9. Invert once out of the oven and unmould by hand when cake is cool (see 'hand unmolding chiffon cakes for a smooth finishing' video). *For the ‘Eeyore version’: To make the cream patch, spoon out 2 tsp batter before adding in the sweet potato paste. 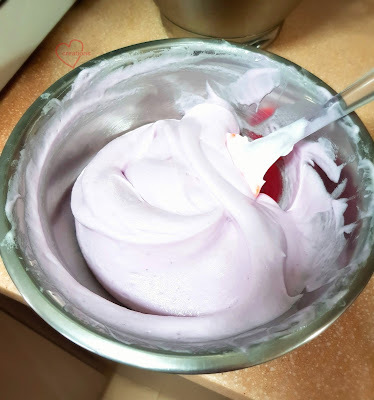 After meringue is whipped, transfer 4 tbsp meringue and fold into plain batter. Pipe cream patch onto tube pan, bake for 2-3 min until patch is dry to touch. Pour purple sweet potato batter into pan. I made the cuts on the face using a sharp knife, and decorated the ‘Eeyore’ with cut-outs from chocolate chiffon sheet cakes. I used a maple leaf cutter for the hair and oval cutters for the eyes. I used melted marshmallow to stick the features on. If you are doing the 'Eeyore' version, remember to keep a small amount of purple sweet potato batter to bake as sheet cake to cut out the ears. Hope you like this sweet and healthy creation! By the way I also cooked with the purple sweet potato paste to make the sweet potato rice! It tastes like the real thing =). 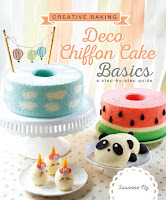 I have bought your book and was informed that there is a workshop on Fri, 9th Feb at centre point. I would like to attend but the link seems to have a problem. Please kindly reserve a place for me and advise me of the time. The last lot time in the afternoon is ideal for me, otherwise, please advise any other slot? Hi, sure you can come for the demo at 320pm. I removed the link as slots are full but you are welcome to come for demo as it's open to public. And maybe there will be people who don't turn up =). Thanks! Thanks Tracy, I think it will work! But it will also depend on the concentration of your sweet potato powder, how much to add. Thanks!